M.F.A., MA The University at Albany, State University of New York. B.S. Skidmore College, Saratoga Springs. Katharine teaches courses in documentary photography and alternative processes as well as photo-related printmaking methods. 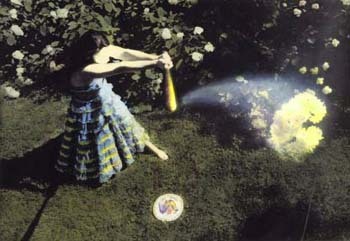 Her autobiographical work centers on highly manipulated photographic images and photo-etchings. Kreisher is a founding member of the Round House Press at Hartwick College. She was an artist in residence at Millay Colony for the Arts, Austerlitz, NY. Kreisher has been part of numerous exhibitions including "Hair" curated by Alison Ferris for John Michael Kohler Arts Center, Sheboygan, WI, and the international traveling exhibition, "Diamonds are Forever: Artists and Writers on Baseball." Her work has been collected by The Center for Photography at Woodstock and Albany Institute of History and Art, among others. 1999 polymer gravure from digital print. "When the Moon Is Right"